By the 1940s, a neighborhood of Tudor-style homes encircled the outskirts of every major urban area in the United States. Half-timbered exteriors, steep roofs and gables mark the Tudor revival style. There are so many wonderful historic neighborhoods in Phoenix with Tudors of all kinds. A few neighborhoods you can check out for a roll back into time are FQ Story, Encanto-Palmcroft, Coronado, Fairview Place and Cheery Lynn. Thanks to their steeply pitched, multi-gabled roof lines and decorative half-timber framing, Tudor homes are one of the most recognizable on the American landscape. Built largely during the first half of the 1900’s, Tudor homes can be found in well-established communities throughout the U.S.
“As businessmen began coming into money, whether through rail, lumber or steel, they set about building distinctive and magnificent homes. Tudors often fit the bill,” explains Victor Saroki, of Victor Saroki and Associates Architects in Birmingham, Mich. But not all Tudors are grand mansions. More modest interpretations of the style are just as prevalent — and just as popular. Practically all, however, are asymmetrical structures dominated by imposing roof lines. “These homes were designed to work with the environment in which they originated — England,” notes Saroki. Steeply pitched roofs are ideally suited to climates with a lot of rain and snow, which is why so many appear along the East Coast and throughout the Midwest. Steep, multi-gabled roof lines. It is not uncommon for the eaves of these dramatic homes to plunge clear down to ground level, or close to it. Decorative half-timber framing. The characteristic half-timbering, the structure’s seemingly exposed wood framing, is almost exclusively ornamental in the U.S. Massive chimneys. The roof lines of Tudor homes are almost always graced with massive chimneys, constructed of brick or stone and capped with elaborate chimney pots. “It was not uncommon to find a fireplace in every room of the house; they were the primary source of heat,” Saroki says. Decorative entryways. Entryways are often arched and outlined with decorative brick or stonework. Windows in groups of two, three or four. Most often casement as opposed to double-hung, the windows are multi-paned, with panes sometimes arranged in a diamond pattern. Edsel and Eleanor Ford House. 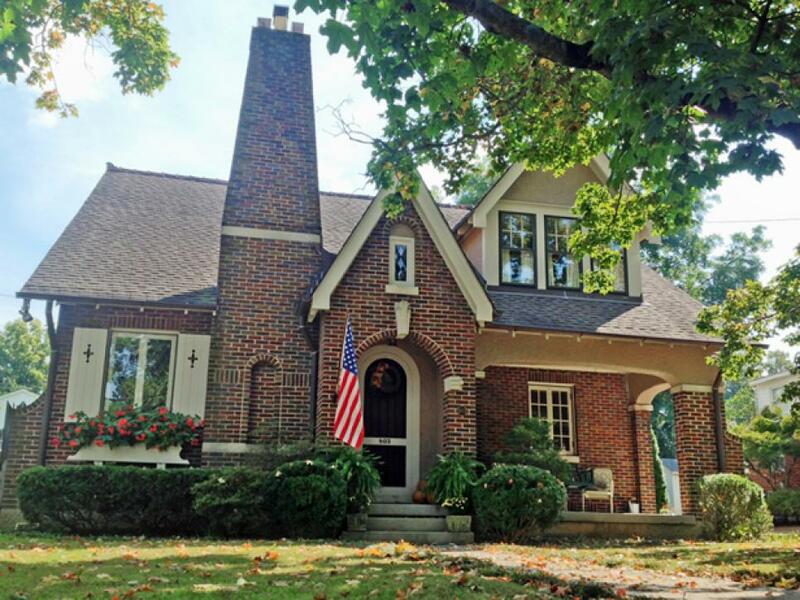 Now a museum, the Southeast Michigan home is a symbol of American wealth and prosperity. It is also a model of Tudor architecture. Designed by famous architect Albert Kahn, the 60-room mansion features multiple gables, projecting dormers and towering chimneys, all characteristic of the style. Because these homes are built from noble materials, what Saroki refers to as “lifetime” materials, they tend to hold up very well. “But just as a body needs periodic maintenance, so does a Tudor home,” he says. Multiple gables with intersecting roof lines can mean multiple leaks and numerous headaches. Check the interior thoroughly for water damage and inspect the roof’s integrity. The same holds true for the dormers, which are built into roof lines and prone to leaks. Old casement windows are typically no friend to energy bills, so look for tight seals and working storms. Tudor homes possess a lot of wood detailing, in the form of half-timbering, wood overhangs, and trim, which should be examined for moisture problems and will need regular stain or paint applications. Unlike, say, the Spanish Colonial home with its large central courtyard, Tudors are all about indoor living, notes Saroki. Found primarily in Northern climates, Tudor homes boast grand stone hearths around which families gather and relax. Dark wood paneling, exposed timbers and luminous stained glass windows all add to the cozy appeal of this architecture style. Check out other architectural styles in The Historic Phoenix Districts.